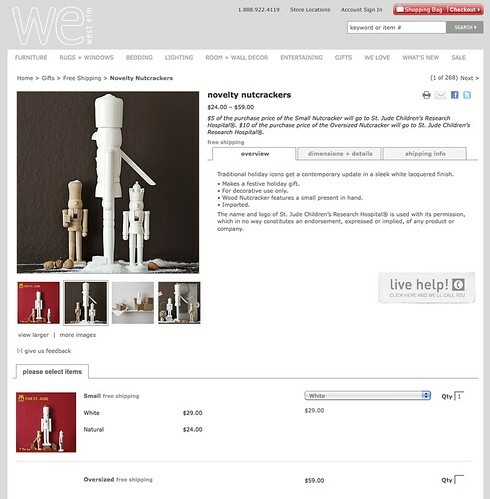 West Elm has the cutest Novelty Nutcrackers! Only problem is, they are TWENTY NINE BUCKS! And if you want the jumbo one it’s $59! Ouch. I’m not cheap, I’m thrifty! So I plotted a scheme to get me surme o’ those there nutcrackers. I found these hideous things at the Dollar Tree. The hair! The hair is what kills me. I ripped that hair off quicker than you can say “holy-hell-that-looks-horrible” and gave them all a good coat of spray paint primer. 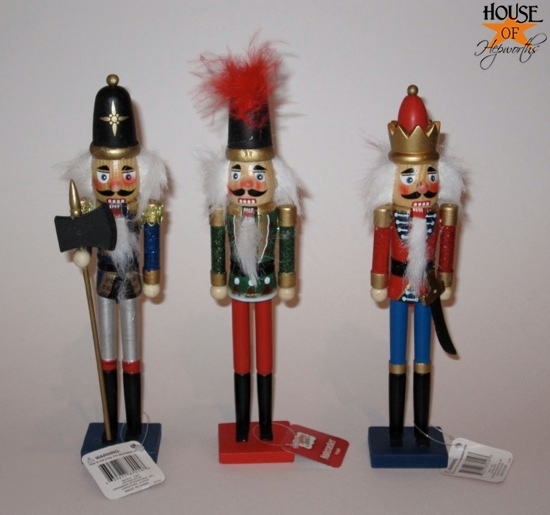 Now I’ve got three totally adorable West Elm Knock-Off Inspired Novelty Nutcrackers. All for three bucks and some left-over spray paint. That’s my kind of Christmas decor. 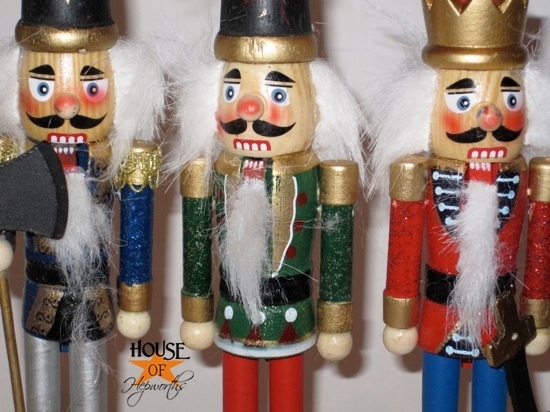 Have you made any Christmas decor Inspired by a favorite store? Awesome job! They look terrific! Oh my!!! Those are fabulous!! Well done! So much nicer white and silver! They sure were hideous before! Ha!! Thank you! I can’t believe how simple they were to make. Such an easy but adorable project. Those look awesome!!! Your’s look better than the ‘real’ ones..seriously – they do! Wow, thank you for your compliment. they are so much better after! nice touch! OH MY GOSH! I was just at the dollar tree last night1 I’m goin’ back! thanks for the idea! I love these! The hair on the originals weren’t what was killing me- it was those faces!! Great job! Have you seen the plain unfinished wooden ones at Hobby Lobby? You could have just painted those and not had to mess with the horrible hair and paint! I haven’t seen them. I’ll have to go check them out. Thanks for the heads up. That is awesome! I might just have to “steal” your idea! Great job! has anyone ever told you that you’re a genius? The before and after are really pretty amazing! Love these! WOW – I love this and have some ugly ones that don’t even make it out of the box! Those are amazingly better! I still need to make a dollar tree run soon! I did make a pottery barn knock-off NOEL sign. Saved $100! 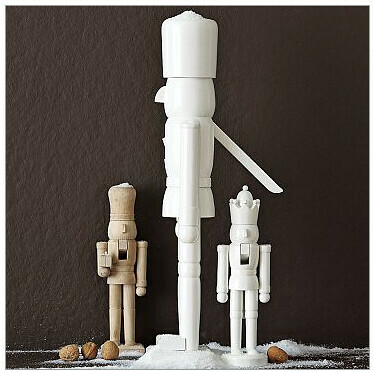 Wow, I have never been a nutcracker fan, but yours are amazing at the perfect price, next to nothing. Oh so cute! I may have to copy. However, you do realize that part of that $29 probably went to helping young children tackle cancer? I mean, what else could “St. Jude” mean, really? But, if you’re not really in the “saving little children” mood this Holiday Season, why not go for the $3 kind. lol. =D love ya! I was just at dollar tree yesterday, but I am going back today to do this project! They look awesome! Great idea! LOVE it!! 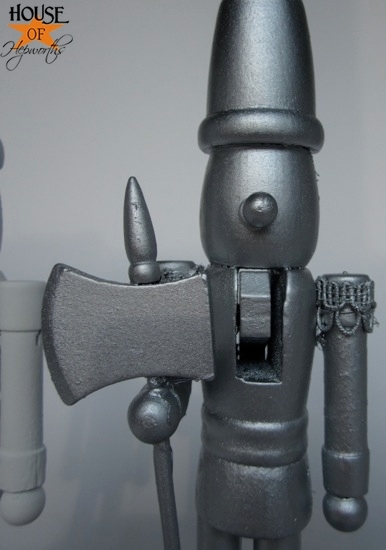 I have always had a love/hate relationship with nutcrackers. LOVE the idea, but their faces freak.me.out. seriously. 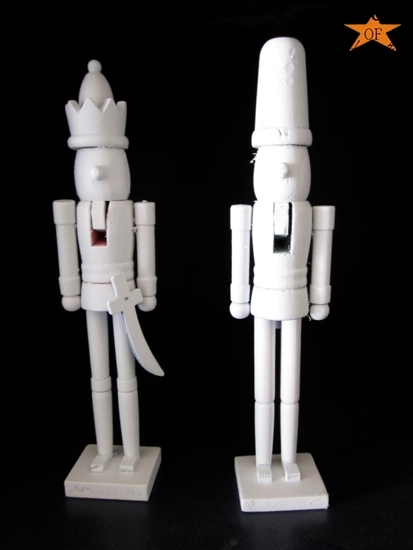 But these little faceless guys are PERFECT. Heading out to the dollar tree today!!! Allison! Those are the CUTEST. What a makeover – kind of shocking, really! I love these! 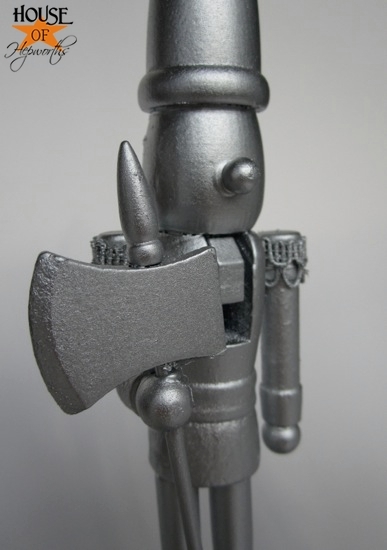 Ill be stopping by the dollar store today for some of these ugly little guys and they’ll be much happier with some spray paint. I wasn’t planning on going into town again today…. but looks like I need to now! 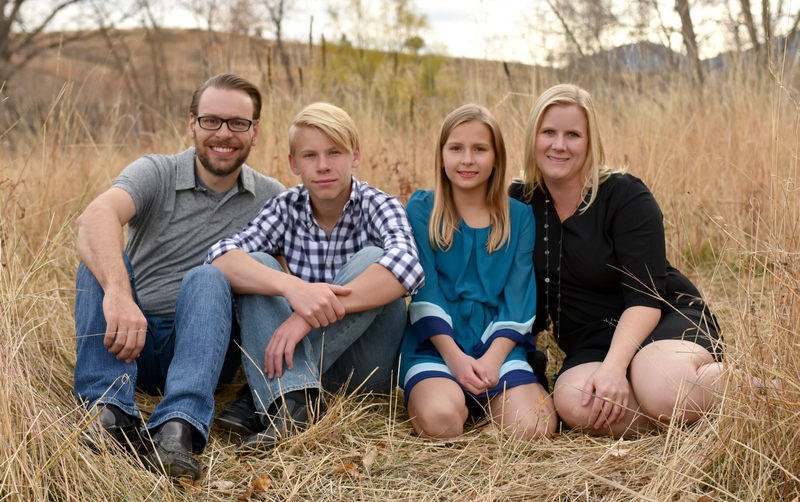 One day I want to be like you when I grow up… I want to be able to take something ugly and make it beautiful, all while being a mom and maintaining a house and doing all that you do! I LOVE your blog and all your projects! You are a hoot!!! And what did you do with the hair? 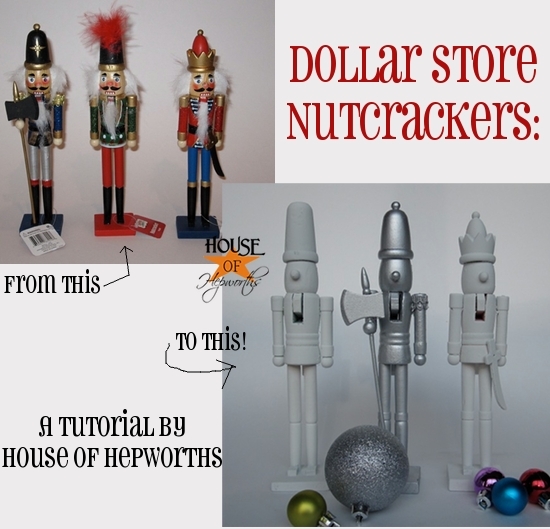 Your nutcrackers are a great knock off. LOL, youre funny lady. great idea too. Oooh la la!!! I love those!!! So wonderful! Do tell though… what did you do with the hair? Unfortunately I tossed it out. Just got home with 6! Can’t wait to transform! Thanks! very professional looking background! however, i think i prefer seeing them in your home more! love your blog!! Seriously – you are genius!!! I totally just showed this to my hubs! You rock!!! 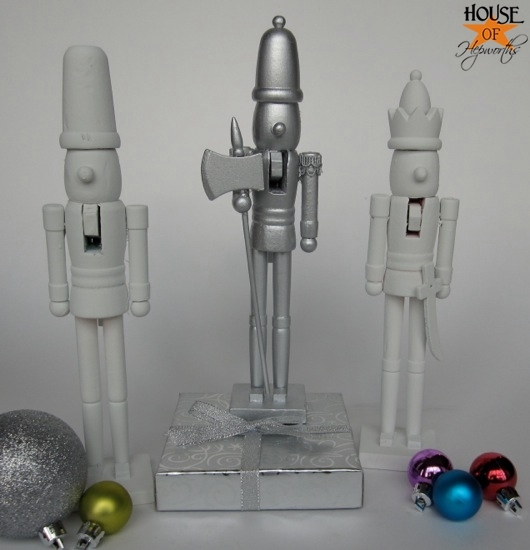 My daughter has been desperate to own a nutcracker (the irony that she’s allergic to nuts) .. but I’ve not wanted to spend the money, b/c I don’t like them .. but for $3 and I’d have to buy spray paint .. but SURE!!! Thanks for the idea – LOVE! What a great transformation! Need to hit up the dollar tree. It’s been too long! Way to make use of the dollar store!! They were truly awful. I love that you left one of them silver. 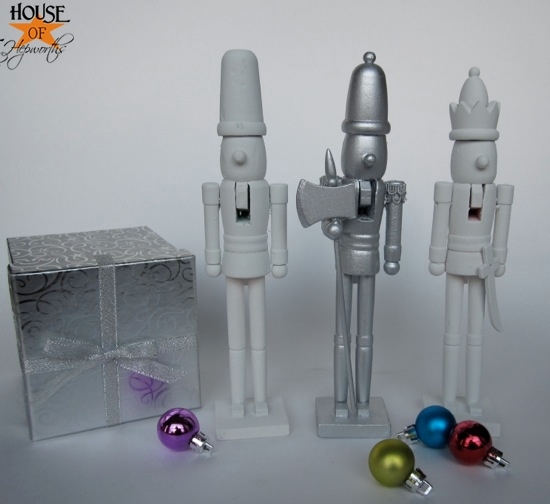 But, lets not paint my collection of nutcrackers, ok? yours look as good if not better! How totally outrageous are these?! Love them! 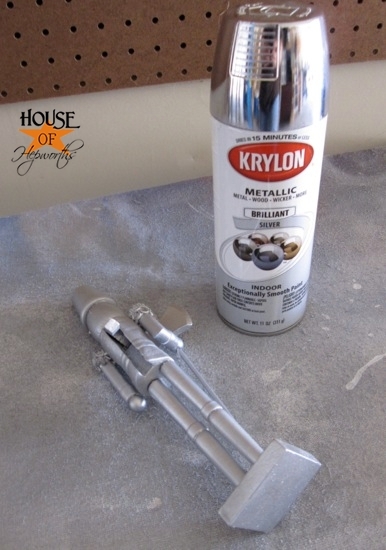 I need to think outside the box and grab some spray paint! As I began reading your post I thought, I HAVE A WHOLE BOX of these in assorted sizes (3″ to 24″) in our storage! I haven’t put them out in years b/c I sorta lost interest in them. 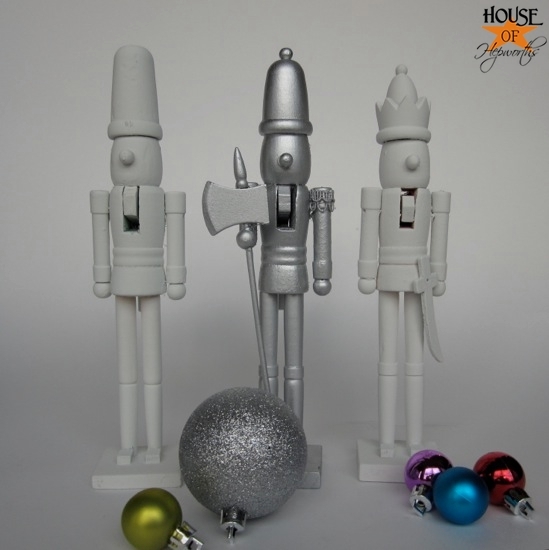 I just might have to dig them out and upscale for the 2010 holiday season, THANKS for sharing this idea. I have these on my mantel. Kinda bummed you think they’re hideous. I have a little boy, he loved them, and I thought they seemed a little vintage. Definitely doesn’t go along with the ‘classy’ christmas that everyone seems to be going for now… but works just fine with the bright red Santa’s and multicolor lights on the christmas tree. Maybe I’m just tacky?! If you love them than that’s all that matters! Totally just got back from the Dollar Tree and can’t wait to transform these dudes! Love this idea!! Totally running–not walking to the dollar store! Thanks for sharing! 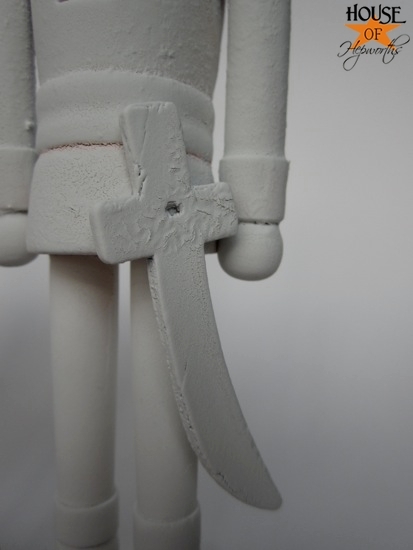 Been doing hand painted nutcrackers for years, do a couple of dozen for Christmas gifts every year. Don’t like my choices of venders, as of now its Hobby Lobby or Michaels. 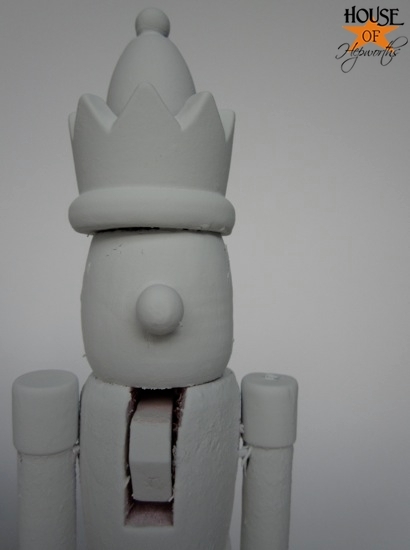 Will you sell the unpainted ones? I prefer those around 12 inches. I’m sorry, I don’t sell them. 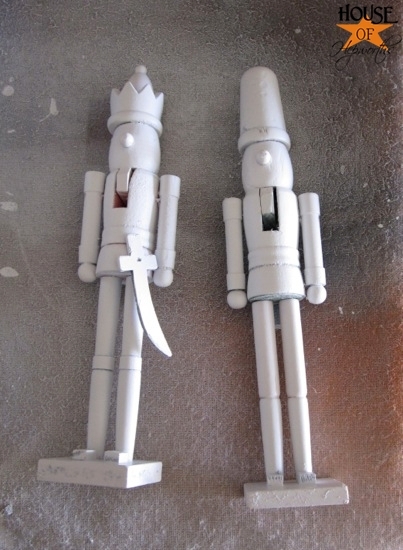 You can pick them up at the dollar store and give them a quick coat of spray paint. Have fun! What did you use to get the hair/glue off? I just yanked it off. No glue remained. OMG how cool is this! I just did the exact same thing to some from the Dollar Tree! I love that you did one in silver, so cute!!! Or, if these alternatives never appeal, you could often make your own variation. How did you get rid of the glue where the hair was attached?